Th e dollar weakened after president-elect Trump called the U.S. currency “too strong” and the pound rallied on British Prime Minister Theresa May’s plans to leave the European Union. This sent the gold price higher Tuesday morning, climbing back above key psychological resistance at $1,200. Gold is currently up $15 or 1% to $1,215 per ounce. Silver has doubled that gain at 2% so far today, up $0.33 to $17.11 per ounce. I believe prices for both metals will move significantly higher in the weeks and months ahead. Donald Trump’s comments about the dollar being too strong were told in an interview with the Wall Street Journal. Part of the reason is because China artificially holds down its own currency, thus inflating the relative value of the dollar. The greenback is the only major currency whose current strength has coincided with rallies in its domestic equity market. 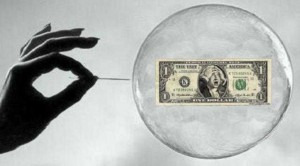 Kit Juckes, global strategist at Societe Generale says there’s a “real dearth” of drivers to continue the greenback’s uptrend. Long dollar positioning is the most crowded trade in global markets, with the USD reaching recently hitting overbought levels. It has since corrected sharply, dropping over 3% from the start of 2017. The USD index is now resting at the critical support level of 100, which had acted as resistance multiple times over the past few years. A drop below this level would be very bearish for the USD, as the index would fall back into it’s long-term consolidation trend channel. 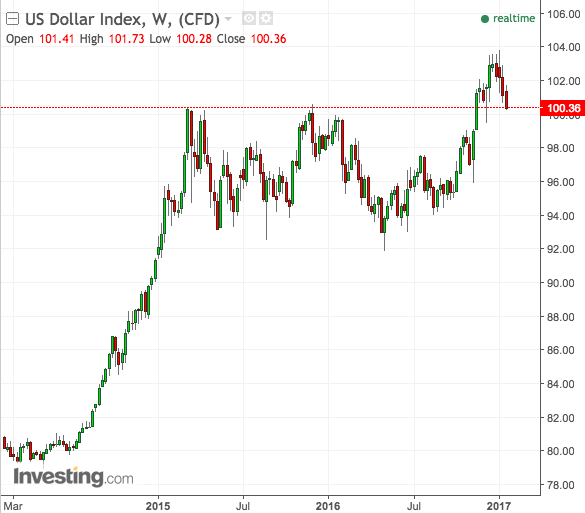 Many analysts would then question whether the dollar rally over the past few months was a false breakout. With significant political changes afoot, much will depend on the words and actions of the Trump administration in his first six months of office. The gold price has rebounded sharply as the dollar rally has fizzled. It is important from a technical perspective to note that the recent drop registered a higher low versus the December 2015 low. This is a bullish indicator that we would like to see confirmed with a new higher high above $1,375 in the months ahead. Gold is now up roughly 8% since bottoming in late December. While that is a respectable gain, mining stocks (GDX) have returned 23% over the same time period, generating leverage of 3x. Junior mining stocks (GDXJ) have returned 35% over that same time period, for leverage of 4.4x. Many of the junior miners that we track are up more than 50% over the past three weeks! 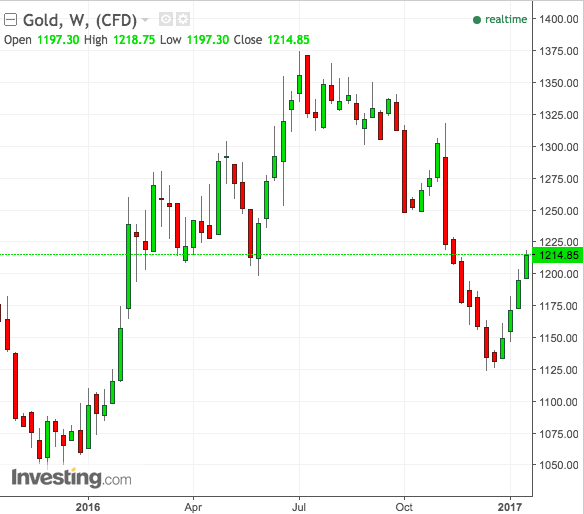 Get our top gold and silver stock picks for 2017 by joining our premium membership. In addition to analysis of the most undervalued gold and silver junior mining stocks, we also cover other sectors including energy, agriculture, uranium, lithium, cannabis, bitcoin and more. The GSB portfolio had a return of 69.7% in 2017 and is up nearly 15% during the first two weeks of 2017 alone! Try it out for just $95 by clicking here now!